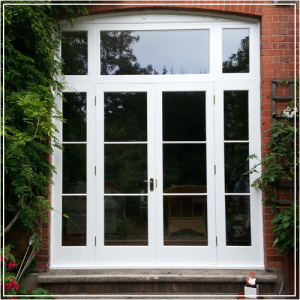 Constructed of durable, long-lasting timber that far exceeds regular strength and safety standards, our French doors come pre-sealed against the elements, in a choice of painted, natural and bespoke finishes to suit the existing character of your home, or make a stylish and contemporary statement. Combining traditional standards of joinery with the latest materials and construction techniques our timber French doors provide industry leading security, insulation and reliability without compromising on style or appearance. All of the doors we supply conform to, and in many cases exceed, current UK building regulations and European quality standards. Depending on setting and your choice we provide a wide range of glazing finishes as standard, including patterned, obscure, safety and laminated glass. To ensure they compliment your home perfectly we can install new French doors that open inwards or outwards and offer a broad selection of fittings, handles, locks and furniture. To learn more about our Timber French Doors, or arrange a free, no obligation visit and quotation, send us an email or call one one expert fitting team today.